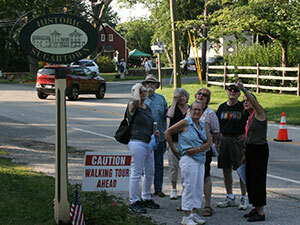 The 24th summer of Chester County’s Town Tours & Village Walks will begin on June 14 at the Chester County Historical Society in West Chester. The theme of this year’s series is exploring the county’s roots of industry and innovation. There will be 10 more free tours this summer, mainly every Thursday night. The free summer strolls will take place in historic neighborhoods, hamlets, villages, and sites throughout Chester County. Check out more information about the events or contact Heritage Preservation Coordinator Karen Marshall at kmarshall@chesco.org for a brochure.